Introducing JLG Digital, the exciting, new subscription service that makes it easier for you to discover new titles! 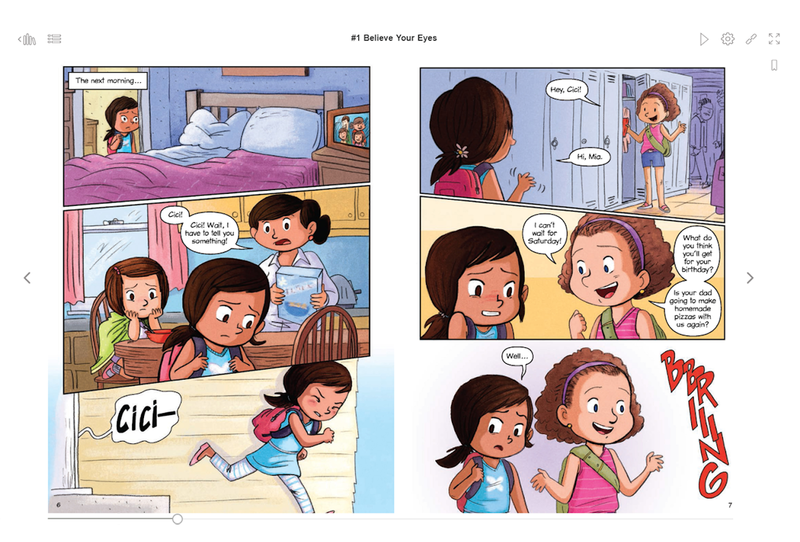 Provide your K–12 readers with Gold Standard books in the formats they enjoy and see what titles are most popular before you buy! 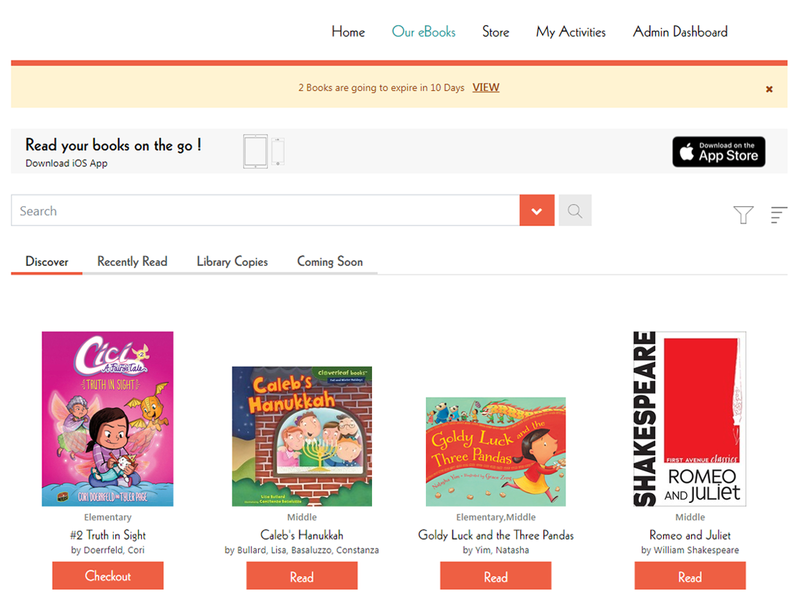 Easily browse and search Gold Standard ebooks and audiobooks, expertly curated by genre and grade level and automatically added to your Selection Stream. Each month, you will automatically get access to up to 20 new trial titles, which will be added to your Selection Stream for your readers to explore at no additional charge for a period of 30 to 90 days. Review usage reports and instantly discover which books your readers are interested in BEFORE you purchase. At the end of each book’s trial period, decide, based on actual data, if you’d like to purchase the title for your collection. When you subscribe to JLG Digital, you will automatically be given trial access to up to 20 new titles each month AT NO ADDITIONAL CHARGE. Your readers will have access to the books in your Selection Stream for the length of each title’s trial period, which is between 30 and 90 days. What makes JLG Digital Different? At any given time, you’ll have access to approximately 50 trial titles in your Stream. An unlimited number of readers can access any book as many times as they choose during the trial period. 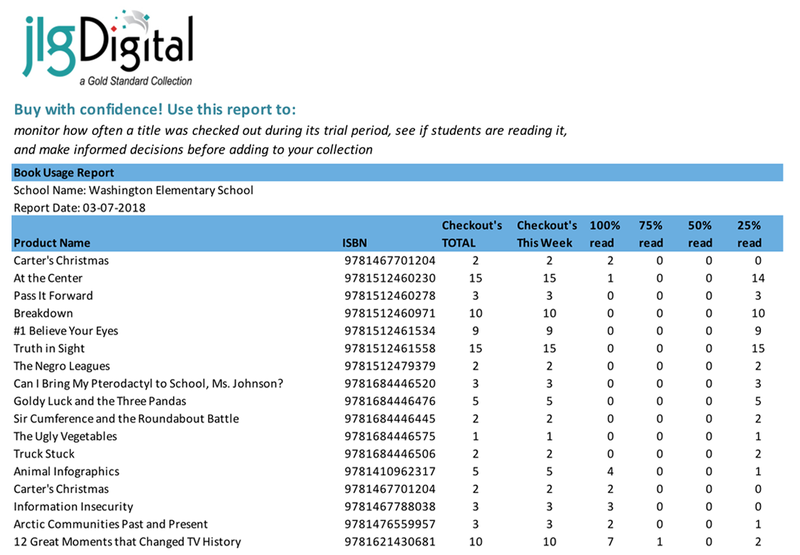 At the end of each title’s trial period, you can see which titles are most popular with your students BEFORE you purchase and permanently add them to your collection. • Carefully curated selection. Gold Standard ebooks and audiobooks are selected by our expert curation team, and are searchable by age-appropriate thematic or genre-specific categories. • Easy browsing. As new titles are added to the Stream, previous titles exit and become available for purchase, meaning you'll have approximately 50 titles in your Stream at any given time. And you can browse the store anytime to search our entire selection of titles. • Huge selection. We’re always adding new books! Over the course of the year, you will receive access to approximately 200 new trial titles. • Fair market prices. All ebooks and audiobooks are competitively priced, and don’t forget you have the added value of seeing how popular each title is before purchasing. Most students feel more comfortable with digital content because they don’t know a world before technology, and with JLG Digital you have the ability to prioritize their preferences to fit their individual needs. Personalizing their experience promotes confidence, enthusiasm and motivates them to continue reading. Your readers will have the opportunity to enjoy the award-winning selections they love from JLG with anytime, anywhere access. Browse, borrow, and read editors’ top picks across all categories instantly on a phone, tablet, or computer. At the end of each book's trial period, use the JLG Digital data to decide whether to add it to your collection. Purchase confidently, knowing your selections will circulate. Deciding which titles to purchase can often feel like navigating a chaotic sea of ebooks and audiobooks. And with budgetary restraints, selecting titles that will circulate well is more important than ever. • Choose titles confidently, because you’ll have the data to back up your choices. Interested? Get more information about a demonstration and free 30-day trial.